Can My Relatives Claim My House Even If My Will Says Otherwise? Clarity is crucial when making a last will and testament. If there is any ambiguity in the terms of your will or a related estate planning document, your heirs or relatives might try to take advantage of the situation after your death. In effect, they could attempt to argue that you did not say what you mean–or mean what you say. Consider this recent probate dispute from Baker County in northern Florida. The decedent in this case was a man who had no wife or children. He passed away in August 2016. 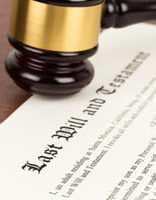 Fortunately, he did leave a will, which devised “all property I own at my death that is subject to this will” to a friend, whom he also named as personal representative. The decedent did not own much property when he died. According to the probate inventory filed by the personal representative, the decedent’s estate consisted entirely of his house and truck. The combined value of these items was just under $150,000. While it may not have been a large estate, there were nevertheless other relatives of the decedent who stepped forward to claim part of it. Specifically, several relatives filed a petition with the probate court seeking a declaration that they, not the personal representative, were legally entitled to the decedent’s house. The relatives based their claim on Florida’s unique law governing the devise of “homestead” property. We recently addressed this law. Under the Florida Constitution, a property owner may not devise their “homestead” by will if they are survived by a spouse or minor child. This provision exists to protect these two groups of people from essentially having their house suddenly taken away from them due to the owner’s death. But in this case, the relatives of the decedent had no standing to invoke this law. According to the Florida First District Court of Appeal, when a decedent is “not survived by a spouse or by minor children,” as was the case here, there is subsequently no “constitutional restriction on the devise of the homestead.” The house is simply another piece of property subject to disposition under the will. The First District further rejected the relatives’ attempt to argue the will was somehow ambiguous. The will was “succinct” but clear: Any “devisable property that the decedent owned at his death” went to the personal representative. This included the homestead, since it was not subject to the constitutional restriction discussed above. It should be noted that if you choose to leave an otherwise unrestricted homestead to a friend or non-relative, as opposed to a descendant or legal heir, the property may be subject to creditor claims after your death. This is yet another feature of Florida’s constitutional approach to homestead protection. A qualified Fort Myers estate planning attorney can further advise you of the law in this area and help you develop a will or trust to protect your property. Contact the Kuhn Law Firm, P.A., today at 239-333-4529 to schedule a free estate planning consultation with a member of our team.